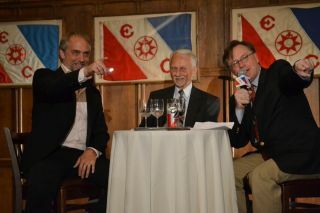 Richard Garriott (left) picks out fellow space tourist Dennis Tito in the audience at the Explorers Club. On Sept. 4, 2013, Garriott and his father, former NASA astronaut Owen Garriott (middle) were interviewed by adventurer and journalist Jim Clash (right). NEW YORK – As microgravity makes even the most mundane tasks tricky, going to the bathroom in space can be a chore. How astronauts take care of that basic human necessity while in orbit has been a point of perennial fascination for the Earth-bound public. For a moment during a Sept. 4 talk here at the Explorers Club, two of the world's first space tourists who paid their way to the International Space Station traded stories about their space toilet training, or actually the lack of training. Richard Garriott as seen in "Man on a Mission," a film by Mike Woolf. While Owen Garriott flew with NASA aboard U.S. space station Skylab and the space shuttle Columbia, his son became a spaceflyer in his own right in 2008 after using his gaming fortune to buy a multimillion-dollar ticket to the space station aboard a Russian Soyuz capsule. Adventurer and journalist Jim Clash interviewed the duo in front of a small audience and afterwards gave the night's first question to another private spaceflyer in the room: American businessman Dennis Tito. A longtime space enthusiast, Tito made his millions in the world of finance, but was once an engineer at NASA's Jet Propulsion Laboratory. Widely considered the first space tourist, Tito paid the Russians a reported $20 million for his 2001 flight to the space station. The younger Garriott earlier in the night said he used to look at Tito and think, "That's the guy that got my seat!" Garriott's long-held aspirations to go to space — first dashed when he learned his eyesight was below NASA standards — had to be postponed for a few years after his wealth took a hit in the dot-com crash. Businessman and private spaceflyer Dennis Tito in the audience at the Explorers Club in New York on Sept. 4, 2013. Tito stood up to ask his question and paused before saying, "One experience that people always ask me about is, 'How do you go to the bathroom in space?'" As the audience laughed, Owen Garriott jumped in to add: "Elementary school children, usually." But Tito continued, saying that despite his eight months of training with the Russians, he wasn't all that prepared to go the bathroom in space. "I guess the Russians really don't like to talk about these things — they have funny attitudes," Tito said. "So I got on board the station and the first thing that happened was Jim Voss, an American astronaut, gave me toilet trailing." "Now, I hadn't had toilet training in 60 years," Tito added. "So I was wondering, did you get toilet training on the ground?" Richard Garriott, who trained with the Russians, too, corroborated Tito's story. "It is hilarious because every other system — everything except the toilet — you use the exact hardware you will use in space on the ground," Garriott said. Garriott said he had a cheat sheet for which switches to turn on for when he needed to use the space commode, the toilet does not work the same way as it does on the ground. "Gravity's actually really important for how to separate yourself from your waste and there's no discussion of that," Garriott said. His father chimed in to give a perspective from the U.S. side, and discussed his training with NASA ahead of his 60-day stint in space during the Skylab 3 mission in 1973. "We did receive proper training," the elder Garriott said. "For urination it's a very simple thing ... Urination is not a problem. Defecation is what you're concerned about." Garriott said the Skylab astronauts used a simulator toilet mounted over a camera so that they could check their positioning on the ground before using the commode in space. All three Skylab crews out also brought home all of their waste to be examined by scientists, Garriott added, remarking that they never had a single toilet failure while in flight. "One thing NASA did right," he quipped.